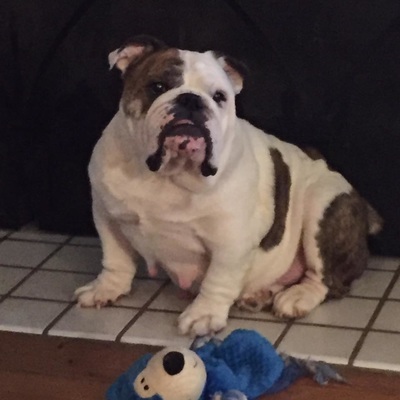 Date Available: Moved to available on 12/3/2016-Gigi will be available to move to her new home on or around December 23, 2016, just in time for the holiday! It is important to note that I will need a gradual return to normal activity. I'm okay with taking rests and staying in my crate even when other pups are out and about. Don't worry about me, in the long run this is for my own good! ​DOB: Unknown, but my foster mom says it's the day God sent down an angel. Yeah she's sweet! Weight: 46 pounds of squishy"ness"
Color & Markings: White, Brown, Brindle. Good with other dogs: Yes, I love other dogs and I'm super submissive. However, I don't like it when they get all up in my crate space. I also don't love if they try to take my toys, but even then I'm pretty layed back. Good with cats: Yeah, I don't care anything about cats, they are just there. Object Aggression: My foster mom says it's not object aggression, but I do like to play with my toys without the other dogs trying to take them. I don't really get mean, but I get a bit growly, but they take them anyway and I sulk away. Special Needs: I'm a very special girl. 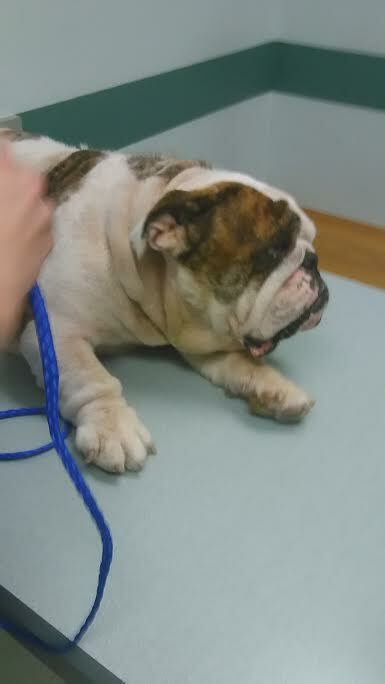 When I came in to BBR in September, I was Heartworm positive. BBR gave me the treatments and I have finished those. I'm still on bed rest until mid-December which is why I can't move to my forever home quite yet. I will go back to see the vet for a check-up and if all goes well, I can be adopted that week. 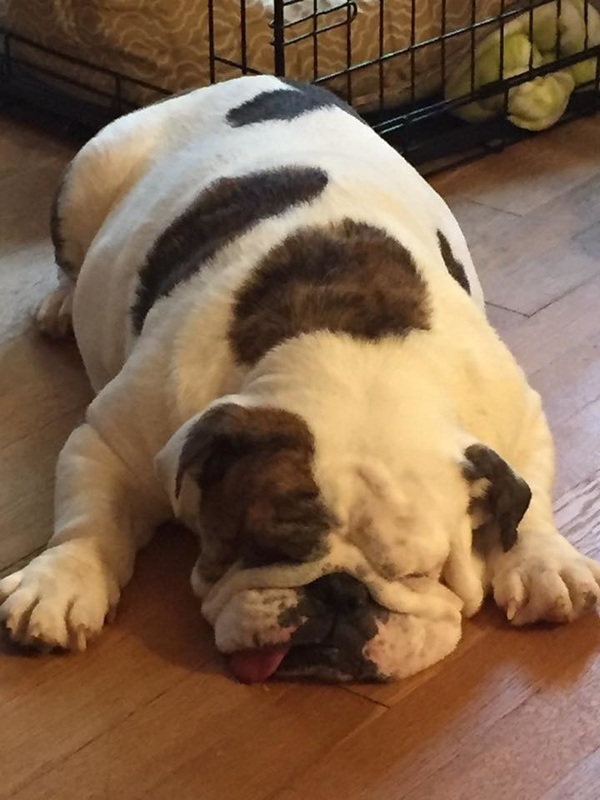 If you don't know anything about heartworm, it's a pretty serious illness, but my foster mom says I'm a rock star and I handled it like a BOSS! It will be important for anyone that adopts me to know that I will need to be checked regurlarly and receive monthly heartworm preventative from now on. This is the most preventative illness that us dogs can get for around $20.00 a month you can stop it before it starts. Don't be afraid that I will pass it to any of your dogs. Heartworm can only be passed on by mosquitos. Also, it's important to keep my folds nice and clean and dry. So, I will need my wrinkles cleaned daily to make sure that I don't get any icky skin infections. 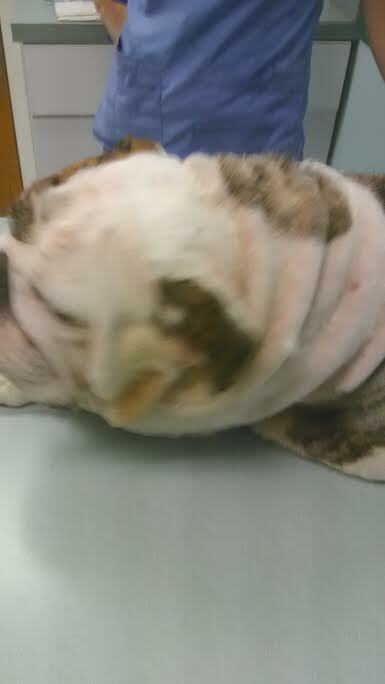 My vet said that my skin looks good as compared to what it looked like when I arrived. Regular baths with good shampoo for special dogs is all it takes to keep me looking great. When I came in they said I was missing lots of hair! My foster mom says my coath is stunning now and I am not missing any hair! I have chronic dry-eye. 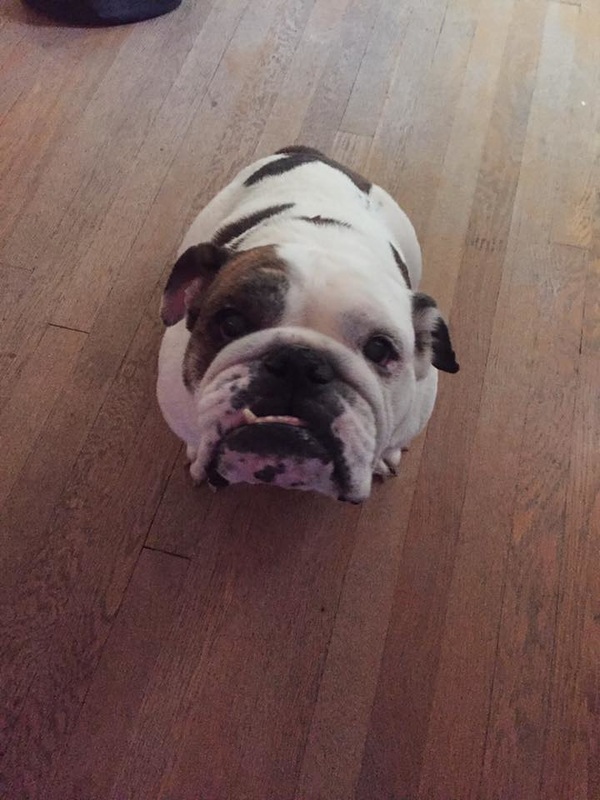 This is very typical among bulldogs (for whatever reason), but if you just give me Tacrolimus indefintely, and Optixcare ointment 2X a day, we can keep these eyes looking great! Both of these meds are affordable and other than you have to help keep my eyes open, I definitely do not mind getting my eye meds! My legs were weak from spending too much time in my crate, but they are getting much stronger. 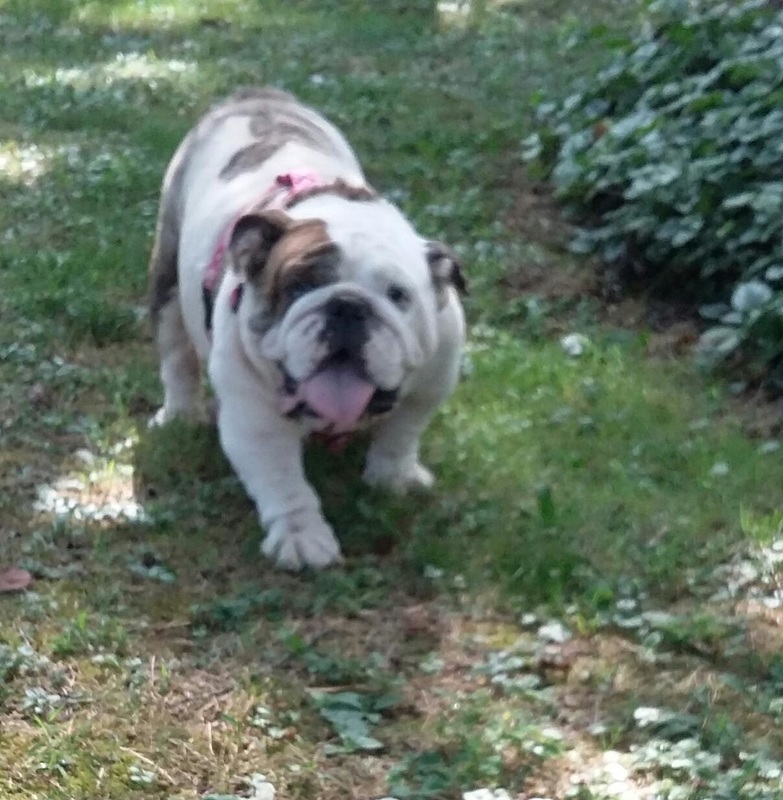 My foster mom says I run swift as lightening. She also said that by lightening she means "like a snail on speed"! I take Phycox daily to help my joints and brief movement and exercise has really strengthened my legs. Crate Trained: I am fully crate trained! However, I do like to go in my foster brother's crates and pee on their beds :) So, it's best that you don't let me. I don't know why, maybe because they are annoying and always in my way! House Trained: I am a puppy mill pup. Sadly, i gave birth to many litters of pups and was never properly shown how to be a house pup. I don't love going outside, I definitely will not tell you, but if you take me out pretty regularly I will go. My foster mom says that I pee and poop on schedule. I love to pee and poop first thing in the moring when I get up. However, I really need to be reckoned with to get outside. If you don't leave me out long enough to do my business, I can be pretty feisty and come back in and go where it's nice and warm. She says that I also need to go back outside 5-10 minutes right after I eat my food. I always have to poo after I have eaten. She also says that I go twice. I always poop twice. She calls me a nickname "Double Pooper Dooper". Physical Fence Required: Due to my slow pace with going to the bathroom, a physical fence would be awesome! That way, I can roam and go to the bathroom when I'm good and ready. Also, due to my heartworm, I can't go on long walks, but I don't mind a leash, but I definitely need some training on this when the weather is nice. Please consider sponsoring Gigi to help with medical bills. My ideal home would be with a family who has the time, patience, and desire to learn about puppy mill dogs. I have a hard knocked life and was used to make puppies my entire life. I have the physical signs of this as my teets are pretty saggy and it will take time for them to improve. My ears were a mess when I came in and those are all better. My skin was pretty bad too, but now my foster mom says with great food and regular baths, I look like a Bulldog Super Model! I'm so soft and squishy she says, maybe that's why she's always squeezing me! My ideal home with have only one or two other dogs for me to love on. My foster mom says that it's good for me to learn by example on how to be a house pet. She says that I love to sit at her feet and when I want a pet, I will just move my little paw to tell her it's time. I sleep in my crate at night and when no one is home, and you won't hear a peep out of me. My crate is my safe space and I even like to rest my chin on the bars of the crate! I don't mind cats, kids, or other critters! I'm an all around great girl and I really just want someone to teach me how to be a pet. My foster mom says that she has literally never met a girl sweeter than me! I know how to sit for treats! She also said that I love food, and I would eat non-stop if she would let me! So, she has me on a strict diet (since I'm on bed-rest) she doesn't want me to gain too much weight. I eat Natural Balance-Sweet Potato and Venison food and I will need to continue that food if you want my fur to continue to look this great! I know that I have some "quirks" that might make some nervous, but I honestly think that if you give me a chance, we can work through anything as long as we do it togther. I overcame heartworm, I can overcome just about anything! 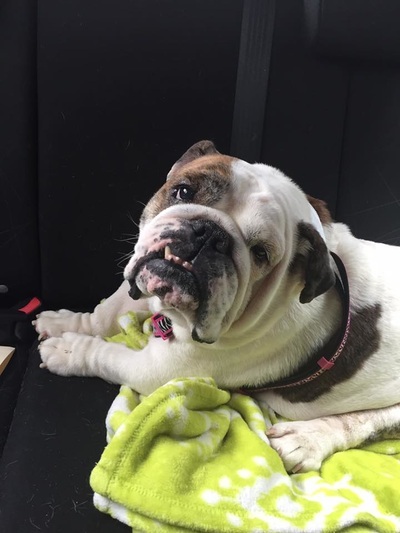 Gigi is a puppy mill dog with severe skin issues, a lot of missing hair, incontinence issues, eye and teeth problems. 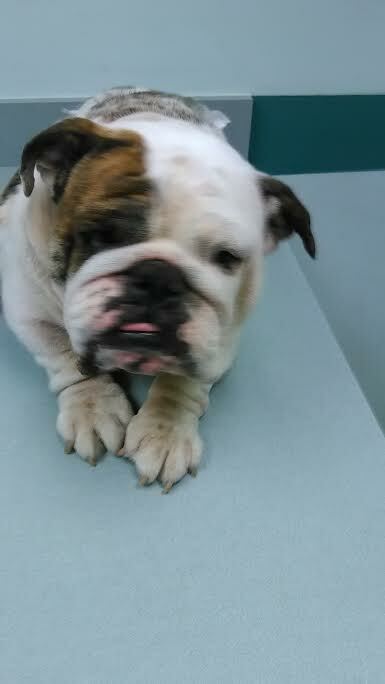 She is getting better at the vet so she can go to her foster home to get ready for her new gorier home!